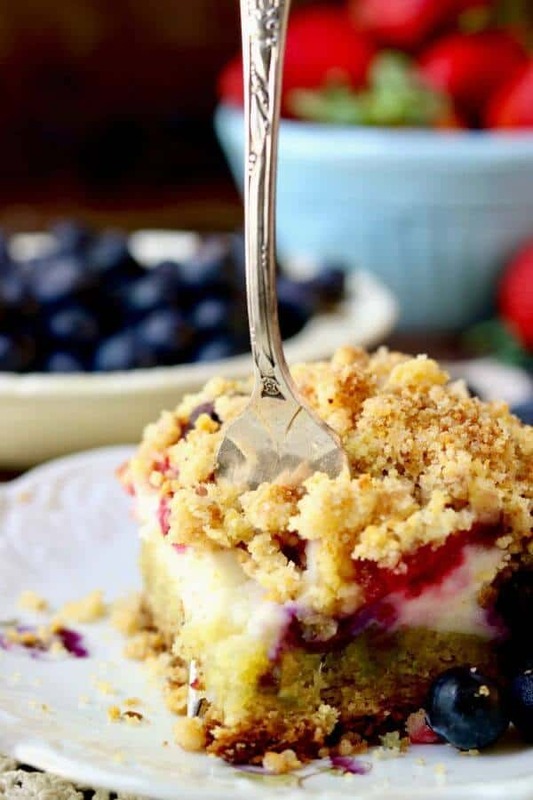 Easy cream cheese coffee cake recipe is stuffed full of rich cream cheese and tangy-sweet ripe summer berries, then topped with a crunchy cornbread crumble that will have you going back for more. Here’s a taste of the south in summer all in one delightful mouthful. Oh my gosh, y’all. This is the stuff, right here. This is why God made summer and summer berries without a doubt. I used blueberries and raspberries in my cream cheese coffee cake creation but strawberries, peaches, mango, cherries…. anything would work as well. You might need to adjust the sweetness depending on how tart or sweet the fruit is – other than that the flavors are going to work perfectly with about any fruit you can pick up at your local farm stand. Well maybe not tomatoes? AND definitely not cucumber. Although I ‘ve been making this coffee cake recipe for years I hadn’t made it in a very, VERY long time. As I was making it I decided that it was time for an update and I wanted something for the crumb topping that was just a little out of the ordinary. You know, I’ve been trying to make sure that I stay true to the Texas/Southern slant of Restless Chipotle — which isn’t always easy. So, when I was putting this together I happened to remember I had half a pan of leftover cornbread from a project I was doing for a client. What, I ask you, what is more southern than cornbread? Cornbread has a naturally nutty flavor and when it’s combined with butter and sugar in the crumb topping you almost taste vanilla flavors. Plus it retains its shape and texture when it’s mixed with sugar, flour, and butter so the crumb topping on this particular cream cheese coffee cake is easily the best that I have ever made. Each luscious bite is redolent of languid summer days that stretched on endlessly, snaking their way through Memorial Day, Fourth of July, and Labor Day – so far in the distance that it was almost unimaginable. I’d give a lot for another summer like that! There was something about waking up on that first morning of no-school-for-three-months-and-dang-what-am-I-going-to-do. I’ve always been a morning person and so summer days were not much different for me. I got up as soon as the chatter of the waking birds permeated my dreams and drew me back from where ever my imagination had wandered during the night. As soon as my eyes squinted open my bare feet would hit the coolness of the smooth wood floor and I’d jump into the least amount of clothing required by my mother, ready to head out for adventure. Back then we had a freedom that has dwindled with each generation. My mother often talked sadly of how much more free she had been as a child than my generation was and I look at my grandchildren and sigh that they don’t know the bliss of long, uninterrupted hours tramping through the woods, free from adult supervision and social requirements. I knew where the biggest, fattest dewberries grew without needing Google Maps to find them. I knew exactly which tree bent close enough to the ground to allow me to climb high into the branches and eat tooth-shatteringly crunchy, not-quite-ripe pears. The education that I received during the summer months was maybe even a little more valuable to me as I reached adulthood than the long months of studying in a classroom the rest of the year. Somehow that freedom allowed me to retain some of the magic of childhood — the belief that anything can happen and that the next moment in time could be life changing. 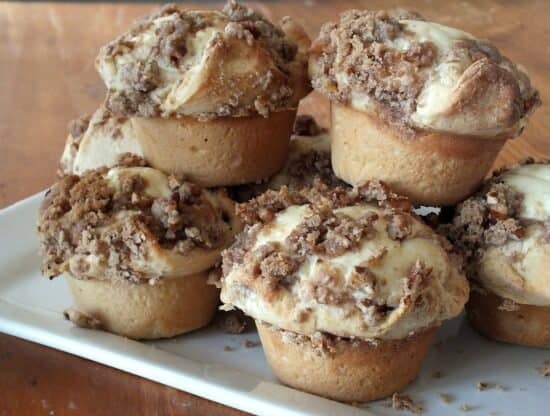 And all of those memories and magic are infused in this cream cheese coffee cake recipe. I’m not sure how but it’s there. The sunny scent of a warm day, the simplicity of walking through the woods, the bright flavor of a sun-warmed berry popped into your mouth… it’s all there for you to experience bite by bite by glorious bite. This makes a large cake. It could easily be cut smaller and feed 16 or more people. 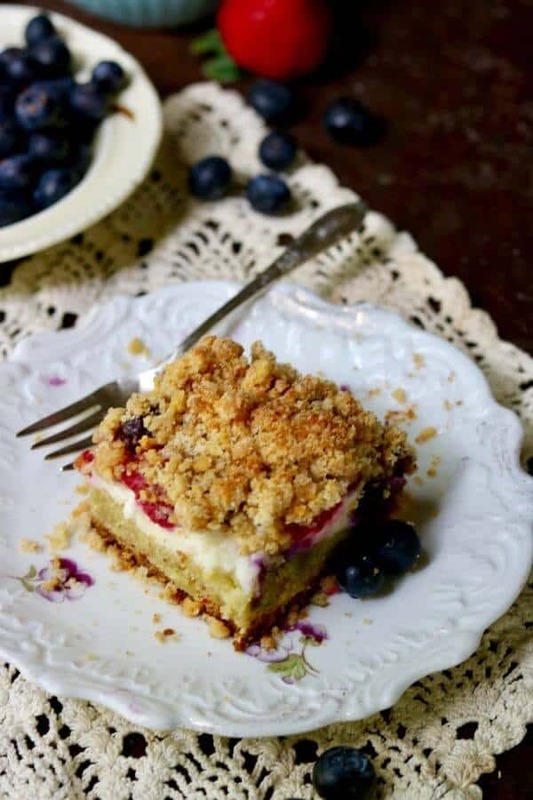 Although cream cheese coffee cake does keep well for up to a week you’ll want to keep leftovers tightly covered in the refrigerator because it contains so much dairy and fresh fruit. 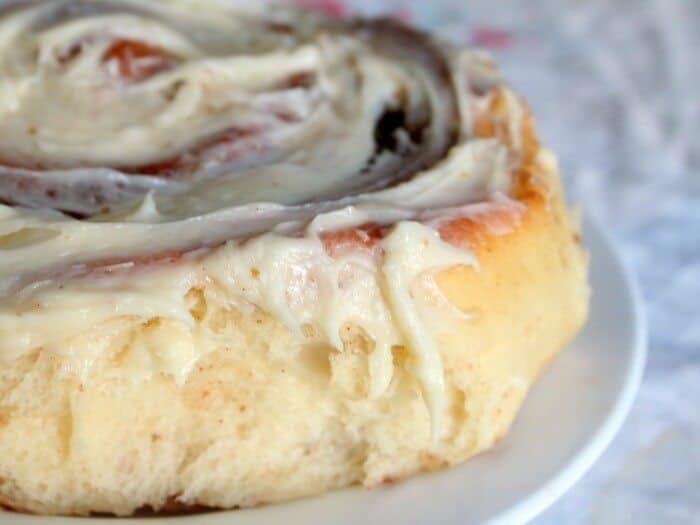 You don’t want to end up with a wine and bleu cheese coffee cake… at least I don’t think you do. Use regular, full fat cream cheese. Don’t use low fat, whipped, fat free, or any combination. It just won’t work – trust me. If you don’t have leftover cornbread you can use bread crumbs or cake crumbs if you must. Don’t use mushy or bruised fruit. It will make the whole thing soggy. This won’t freeze well. You can click on the number of servings in the recipe below and adjust servings either up or down. All of the ingredient amounts will adjust right along with the serving sizes. The cake is not super sweet. It’s got more of a firm biscuit-like texture and buttery flavor than something like a yellow cake. Y’all know I am partial to Pyrex baking pans. I like glass because I think it heats more evenly and I like how it feels. Don’t even ask me why – I just do. If you find that you need a pan to make this cake I’d suggest this 13×9-inch Pyrex glass pan. If you’re looking for a book to read to your kids that *might* inspire them to get outside and off the cell phones I just want to recommend one of MY favorites from when I was a kid, My Side of the Mountain. I loved it SO much I read it to all my kids. And they all loved it, too. 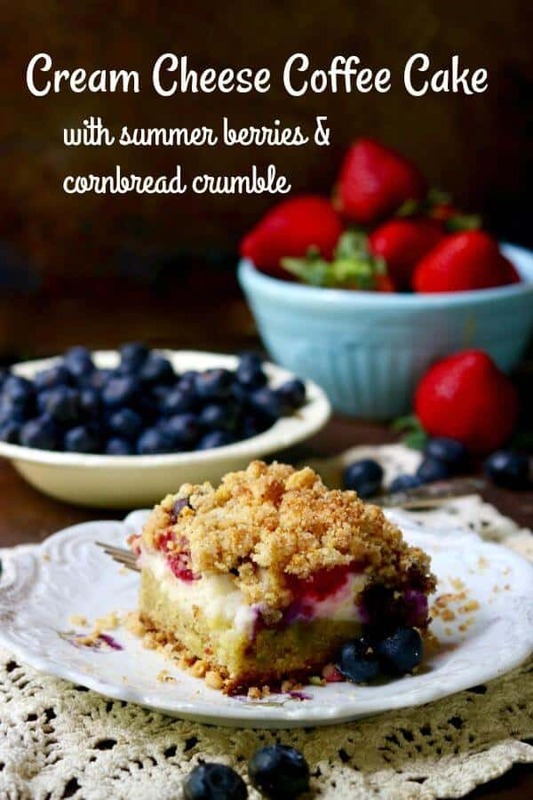 Easy cream cheese coffee cake recipe is stuffed full of rich cream cheese and tangy-sweet ripe summer berries, then topped with a crunchy cornbread crumble that will have you going back for more. As summer progresses use what ever fruit that's ripe and in season! Grease 13x9-inch pan and dust with flour. Stir together flour, baking powder, baking soda and salt together. Cream together the butter and sugar on medium-low speed. Beat in the egg yolks, vanilla, and almond extract. Transfer the batter into the prepared pan and smooth the top. Mix together the cream cheese and sugar on medium-low speed until creamy. Add the egg whites, switch to the whisk attachment, and whip on high speed until the mixture is light and fluffy and has the consistency of good buttercream frosting. 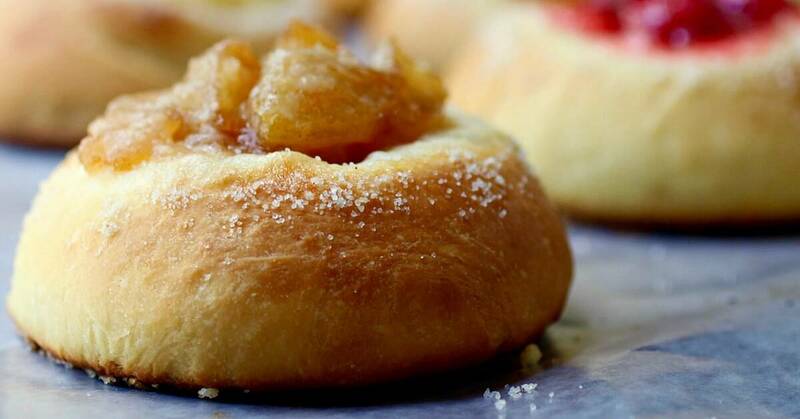 Combine the sugar, flour, crumbs, and butter. Blend and mix with your fingers until you can make a ball with the crumb mixture but it breaks apart into crumbs when you squeeze it. Spread the cream cheese over the cake batter. Sprinkle the raspberries and blueberries evenly over the top. Bake for 45 to 55 minutes at 350F, or until a cake tester comes out clean. If you don't have cornmeal crumbs crushed cornflakes or dry breadcrumbs or old cake crumbs will work as a substitute.